It's that awesome time of the year again to prepare for a garden. We have the greenhouse already growing things and we have planted new trees and bushes this year that will not produce anything until next year. This year is different than any other garden season for us because this is our home and we can finally do everything we have wanted. We have an orange tree, tangerine, lemon and lime tree as well pineapple and banana and the one I am mostly excited about the 3 - 1 citrus, Blueberry, Cherry, Raspberry and Blackberry bushes. Lots of strawberries! We go through them like candy! 5 - 1 Apple, Pear and Peach. Yellow Delicious, Red Delicious Apples just to name a few! We always can a lot starting around now so we are totally ready to kick this season in to gear! Monday was of course CoOp day! Funny story that day, After CoOp we joined some friends at a local park and let the kids play and picnic. While there some of the kids found a lizard and showed him off and let him go on his way. On the ride home Zachary screams "Mom there's a lizard on my shoe!" First off understand Zachary and I do not like lizards! I about freaked out almost like he was! I screamed "GET HIM!" But when Lexi reached to get him the lizard ran. I had to whip the van off the road and wait 5 minutes for them to catch it. After we all laughed we decided to get back in and come home. Next week is our last week and while I love CoOp, I'm ready for it to be over! Zachary had an awesome week! He finished ABeCeDarian book A-1!!! It hasn't taken him long at all! I'm so proud. He is doing so awesome with this publisher. 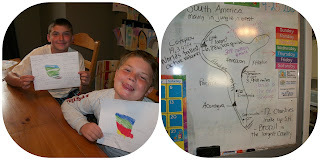 I posted a review on this curriculum at the beginning of the month here and he is still doing awesome and loving it! He has read 2 of the readers and I couldn't be prouder of him but the best part is HE IS PROUD! He tried reading so hard with many other publishers but nothing was right for him. This is ♥. 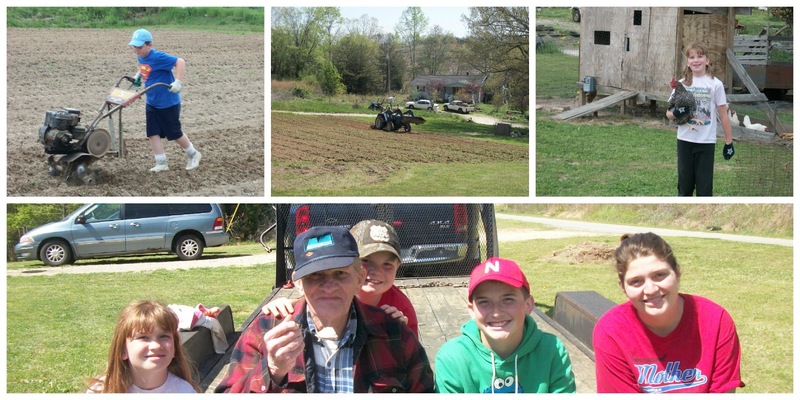 He always enjoys Papaw bringing the tractor! Kyle started reading a book that finally has his interest about a missionary. He has also continued doing great with his writing. He played a lot outside in the woods this week playing survivor. All together we are doing a quick run through on the 7 Continents. I am having the kids' notebook about them as I read facts and details about the places we are learning. So far this week we covered North and South America. This is something the kids have really enjoyed and I am again thankful for that. Alexis is having trouble with her multiplication and we have drilled and drilled on that this week. I guess I need to find some games that help with this which is my goal for the weekend. She has requested to learn about Lions next week so I have a unit printed off for that. 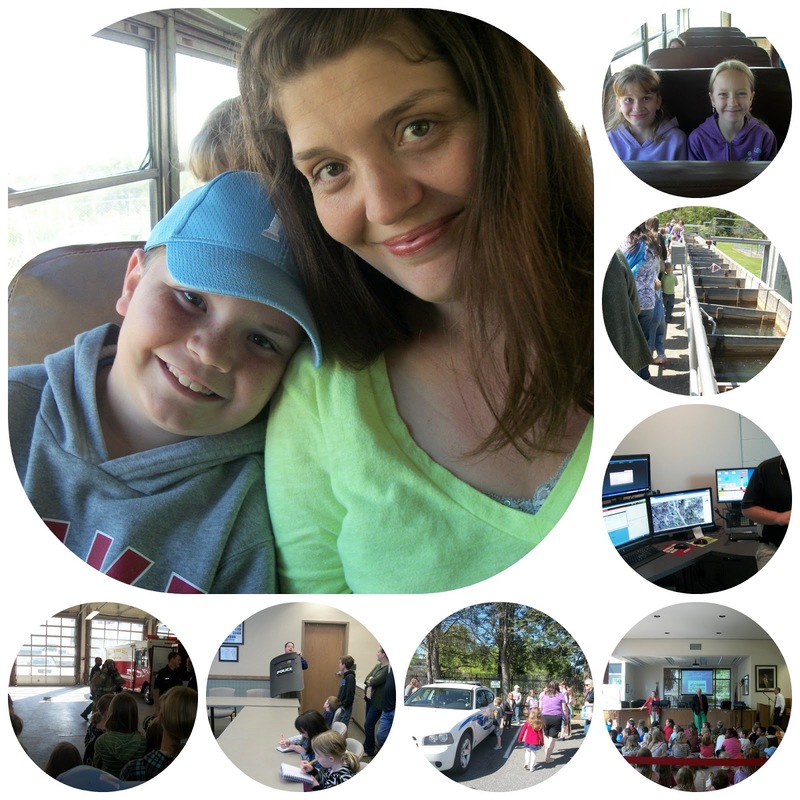 Today - Friday we had a City Field Trip that lasted 5 hours. The local Christian School allowed our homeschool group to use one of the buses they have to take the tour. We toured the Fire Department, Police Department, City Hall then had a picnic and played at the park, Water Filter Plant, Public Works Facility and then to the Waste Water Treatment Plant. This was a long day but filled with lots of fun and learning and a little laughs! The kids each had a favorite spot. We learned a lot of stuff that none of us knew so it was a great day. Zachary had never rode on a bus before and he had been worried about it being unsafe and having no seat belts and even when we got to the meeting place he was still asking if we were going to ride the bus or could I drive, I told him I would sit with him and it was alright! Homeschool kids are totally different! He done really good with the bus until the way back to the meeting spot and the bus driver took the by-pass (like a mini interstate) and started going really fast and he said "Mom are we going to be ok?" I laughed and told him "Of course." As frightened as you must've been of that lizard, it's a funny memory he kids will remember...and that you were able to laugh about it! That's great.